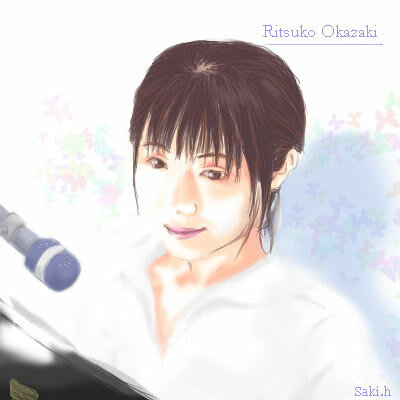 Ritzstar is Ms. Okazaki Ritsuko's database & private fan site. The page under manufacturing is linked with a Japanese page. Ms. Okazaki Ritsuko was born in hasima of Nagasaki Prefecture on December 29, 1959. She moved to Tokyo at the time of 9 years old of the third grader in an elementary school. She formed the band named Erenar at high school days. She participated in the popular song contest of the Yamaha Motor Co., Ltd. sponsoring several times. In 1985, she began the composition activity starting from CM music. She offered the tune to Ayukawa Mami, Ito Toshihiro, and Babe. In 1991, she composed ED theme song 'DaBa DaBa Fallin'Love' for anime 'Mahou no Princess Minky momo'. In those days, she began to compose tunes for Hayashibara Megumi and Komori Manami, afterwards she do also for Inoue Kikuko and Horie Yui. In 1993, she debuted as Singer. In 2001, she composed 'For Fruits Basket' that was the OP theme of anime 'Fruits Basket'. This tune gave the great number of people the surprise. In 2002, she formed the unit 'Melocure' with Hihata Megumi. 'Melocure' is abbreviation of 'Melodic Hard Cure'. She suffered from cancer in May, 2003. She continued the composition activity though she spent the struggle against disease life. She died by sepsis shock on May 5, 2004. There was about 300 music of the numbers of announcement composition of her whole life. Copyright (C) 2004-2010 Ritzstar All rights reserved.